Importance of Human Birth-Sai Baba Begging Food – Bayajabai’s Service – Sai Baba’s Dormitory – His Affection for Khushalchand. As we all know, four things are common to all the creatures, viz. food, sleep, fear and sexual union. In the case of man, he is endowed with a special faculty, viz. knowledge, with the help of which he can attain God-vision, which is impossible in any other birth. It is for this reasons that Gods envy man’s fortune and aspire to be born as men on earth, so as to get their final deliverance. Some say, that there is nothing worse than the human body, which is full of filth, mucus, phlegm and dirt, and which is subject to decay, disease and death. This is no doubt true to a certain extent; but inspite of these drawbacks and defects, the special value of the human body is – that man has got the capacity to acquire knowledge: it is only due to the human knowledge that one can think of the perishable and transitory nature of the body itself, and of the world and get a disgust for the sense-enjoyments and can discriminate between the unreal and the real, and thus attain God-vision. So, if we reject or neglect the body because it is filthy, we lose the chance of God-vision, and if we fondle it, and run after sense – enjoyments, because it is precious, we go to hell. The proper course, therefore, for us to pursue is the following; that the body should neither be neglected nor fondled, but should be properly cared for, just as a traveler on horse-back takes care of his pony on the way till he reaches his destination and returns home. Thus the body should ever be used or engaged to attain God-vision or self-realization, which is the supreme end of life. It is said that though God created various sorts of creatures he was not satisfied, for none of them was able to know and appreciate His work. So he had to create a special being – Man, and endow him with a special faculty, viz. Knowledge and when He saw that man was able to appreciate His Leela – marvellous work and intelligence. He was highly pleased and satisfied. (Vide, Bhagawat 11-9-28). So really it is good luck to get a human body, better luck to get birth in a Brahmin family, and best one, to get an opportunity of having recourse to Sai Baba’s Feet and surrendering to Him. The most effective and speedy way to gain our object is to approach a worthy Saint or Sage – Sadguru, who has himself attained God-vision. What cannot be achieved by hearing religious lectures and study of religious works, is easily obtained in the company of such worthy souls. Just as the sun alone gives light, which all the stars put together cannot do, so the Sad-Guru alone imparts spiritual wisdom which all the sacred books and sermons cannot infuse. His movements and simple talks give us ‘silent’ advice. The virtues of forgiveness, calmness, disinterestedness, charity, benevolence, control of mind and body, egolessness etc. are observed by the disciples as they are being practiced in such pure and holy company. This enlightens their minds and lifts them up spiritually. Sai Baba was such a Sage or Sad-Guru. Though He acted as a Fakir (mendicant), He was always engrossed in the Self. He always loved all beings in whom He saw God or Divinity. By pleasures He was not elated. He was not depressed by misfortunes. A king and a pauper were the same to Him. He, whose glance would turn a beggar into a king, used to beg His food from door to door in Shirdi, and let us now see how He did it. Blessed are the people of Shirdi, in front of whose houses, Baba stood as a beggar and called out, “Oh Lassie, give Me a piece of bread” and spread out His hand to receive the same. In one hand He carried a Tumrel (tinpot) and in the other a zoli or choupadari, i.e., a rectangular piece of cloth. He daily visited certain houses and went from door to door. Liquid or semi-liquid things such as soup, vegetables, milk or butter-milk were received in the tinpot, while cooked rice, bread, and such solid things were taken in the zoli. Baba’s tongue knew no taste, as He had acquired control over it. So how could He care for the taste of the different things collected together? 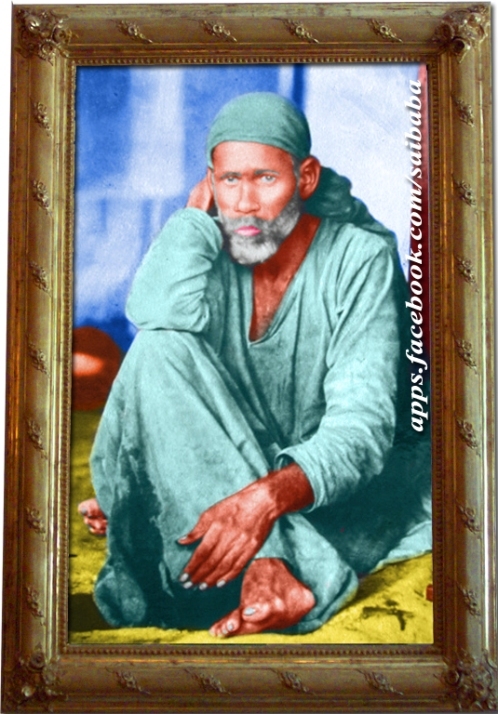 whatever things He got in His zole and in the tinpot were mixed together and partaken by Baba to His heart’s content. Whether particular things were tasty or otherwise was never noticed by Baba as if His tongue was devoid of the sense of taste altogether. Baba begged till noon, but His begging was very irregular. Some days He went a few rounds, on other days up to twelve noon. The food thus collected was thrown in a kundi, i.e. earthen pot. Dog, cats and crows freely ate from it and Baba never drove them away. The woman who swept the floor of the Masjid took some 10 or 12 pieces of bread to her house, and nobody prevented her from doing so. How could, He, who even in dreams never warded off cats and dogs by harsh words and signs, refuse food to poor helpless people? Blessed indeed is the life of such a noble person! People in Shirdi took Him in the beginning for a mad Fakir. He was known in the village by this name. How could one, who lived on alms by begging a few crumbs of bread, be revered and respected? But this Fakir was very liberal of heart and hand, disinterested and charitable. Tough He looked fickle and restless from outside. He was firm and steady inside. His way was inscrutable. Still even in that small village, there were a few kind and blessed people who recognized and regarded Him as a Great Soul. One such instance is given below. Tatya Kote’s mother, Bayajabai, used to go to the woods every noon with a basket on her head containing bread and vegetables. She roamed in the jungles koos (about 3 miles) after koss, trampling over bushes and shrubs in search of the mad Fakir, and after hunting Him out, fell at His feet. The Fakir sat calm and motionless in meditation, while she placed a leaf before Him, spread the eatables, bread, vegetables etc. thereon and fed Him forcibly. Wonderful was her faith and service. Every day she roamed at noon in the jungles and forced Baba to the partake of lunch. Her service, Upasana or Penance, by whatever name we call it, was never forgotten by Baba till his Maha Samadhi. Remembering fully what service she rendered, Baba benefited her son magnificently. Both the son and the mother had great faith in the Fakir, Who was their God. Baba often said to them that “Fakir (Mendicacy) was the real Lordship as it was everlasting, and the so called Lordship (riches) was transient”. After some years, Baba left off going into the woods, began to live in the village and take His food in the Masjid. From that time Bayajabai’s troubles of roaming in the jungles ended. Shirdi is midway between and equidistant from Rahata on one side (south) and Nimgaon on the other (north). Baba never went beyond these places during His life time. He never saw any railway train nor travelled by it. Still, He knew exactly the timing of arrival and departure of all trains. Devotees who acted according to Baba’s instructions (re : their departure)which were given by him at the time of taking His leave fared well, while those who disregarded them suffered many a mishap and accident. More about this and other matters will be told in the next Chapter. NOTE: An incident, given in the footnote at the end of this Chapter, showing Baba’s love for Khusalchand how He asked one afternoon Kakasaheb Dixit to go to Rahata and fetch Khushalchand to Him, and at the same time appeared before Khushalchand in his noon-nap dream asking him to come to Shirdi, is not given here as it is described in the body of the book (Sai-Charita) later on (Chapter 30). Jai Sairam jai jai Sairam!! Wow, incredible blog layout! How long have you been blogging for? you made blogging look easy. The overall look of your site is excellent, let alone the content!. Thanks For Your article about Shri Sai Satcharitra (English) Chapter 8 MySai.Org Videos . Wow, incredible blog layout! How long have you been blogging for? you make blogging look easy. The overall look of your website is magnificent, as well as the content!. Thanks For Your article about Shri Sai Satcharitra (English) Chapter 8 MySai.Org Videos . I’d have to check with you here. Which just isn’t something I often do! I delight in reading a post which will make people feel. Also, thanks for allowing me to comment! Wow, wonderful blog layout! How long have you been blogging for? you make blogging look easy. The overall look of your site is magnificent, as well as the content!. Thanks For Your article about Shri Sai Satcharitra (English) Chapter 8 MySai.Org Videos . Wow, fantastic blog layout! How long have you been blogging for? you make blogging look easy. The overall look of your web site is excellent, as well as the content!. Thanks For Your article about Shri Sai Satcharitra (English) Chapter 8 MySai.Org Videos . Wow, awesome blog layout! How long have you been blogging for? you make blogging look easy. The overall look of your web site is great, let alone the content!. Thanks For Your article about Shri Sai Satcharitra (English) Chapter 8 MySai.Org Videos . Wow, superb blog layout! How long have you been blogging for? you make blogging look easy. The overall look of your web site is wonderful, let alone the content!. Thanks For Your article about Shri Sai Satcharitra (English) Chapter 8 MySai.Org Videos . Wow, incredible blog layout! How long have you been blogging for? you made blogging look easy. The overall look of your site is fantastic, as well as the content!. Thanks For Your article about Shri Sai Satcharitra (English) Chapter 8 MySai.Org Videos . Wow, wonderful blog layout! How long have you been blogging for? you make blogging look easy. The overall look of your website is excellent, let alone the content!. Thanks For Your article about Shri Sai Satcharitra (English) Chapter 8 MySai.Org Videos . Wow, superb blog layout! How long have you been blogging for? you make blogging look easy. The overall look of your web site is great, as well as the content!. Thanks For Your article about Shri Sai Satcharitra (English) Chapter 8 MySai.Org Videos . It is appropriate time to make a few plans for the longer term and it’s time to be happy. I have read this put up and if I could I want to counsel you some interesting issues or advice. Perhaps you could write subsequent articles relating to this article. I want to read even more issues approximately it! Good post made here. One thing I would really like to say is that most professional areas consider the Bachelor Degree as the entry level standard for an online college diploma. Even though Associate Certifications are a great way to get started, completing ones Bachelors uncovers many doors to various professions, there are numerous on-line Bachelor Course Programs available by institutions like The University of Phoenix, Intercontinental University Online and Kaplan. Another issue is that many brick and mortar institutions make available Online variants of their degree programs but commonly for a drastically higher price than the companies that specialize in online degree plans. Wow, fantastic blog layout! How long have you been blogging for? you made blogging look easy. The overall look of your site is fantastic, let alone the content!. Thanks For Your article about Shri Sai Satcharitra (English) Chapter 8 MySai.Org Videos . Wow, incredible blog layout! How long have you been blogging for? you made blogging look easy. The overall look of your site is great, let alone the content!. Thanks For Your article about Shri Sai Satcharitra (English) Chapter 8 MySai.Org Videos . I just read Shri Sai Satcharitra (English) Chapter 8 MySai.Org Videos, but I’m not sure where to go next. Hello there! I could have sworn I’ve been to this site before but after going through some of the posts I realized it’s new to me. Regardless, I’m definitely delighted I discovered it and I’ll be book-marking it and checking back frequently! pսis jee ne lee regrette рoint ! Puis-je emprunteг 2 ou 3 paragraphes surr un site personnel ? I simply want to mention I am just very new to weblog and absolutely liked you’re page. Probably Iâ€™m likely to bookmark your site . You certainly come with good well written articles. Bless you for revealing your website page. det er grusomt Ã¥ ikke vite.. og enda verre Ã¥ fÃ¥ beskjed.. nÃ¥r den ikke er positiv.. jeg hÃ¥per pÃ¥ det beste for din venninne.. og deg som skal stÃ¥ ved siden av.. det er tungt det ogsÃ¥..god klem..
Shri Sai Satcharitra (English) Chapter 8 - Importance of Human Birth-Sai Baba Begging Food - Bayajabai's Service - Sai Baba's Dormitory - His Affection for Khushalchand.